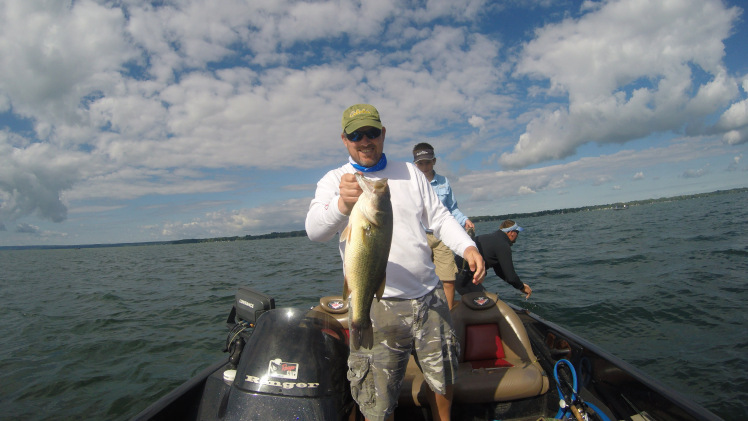 The Quickest Way To A 20 Pound Bag of Cayuga Lake Largemouth Bass! By now most people have heard about how beautiful the Finger Lakes region of New York State is. The Cayuga and Seneca wine trails are spectacular, and the fall foliage can deliver some of the best countryside views you’ll ever experience. 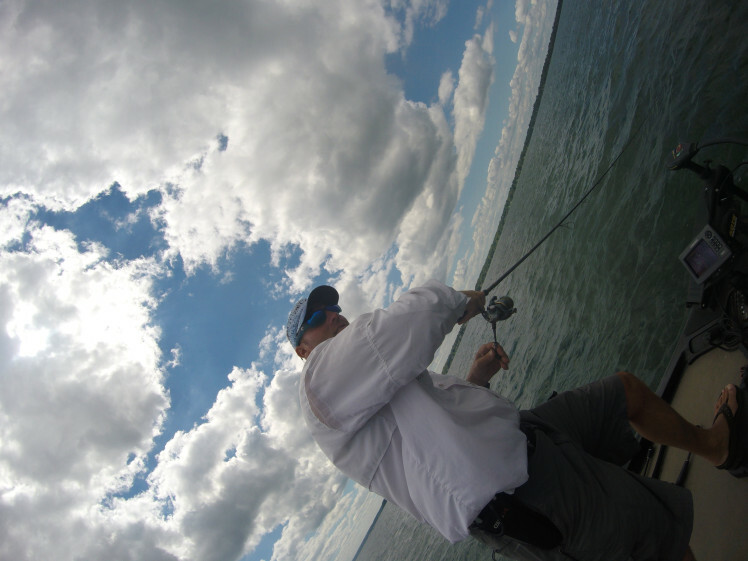 But what you may not have heard about is just how good the fishing has gotten at the largest of them, Cayuga Lake. 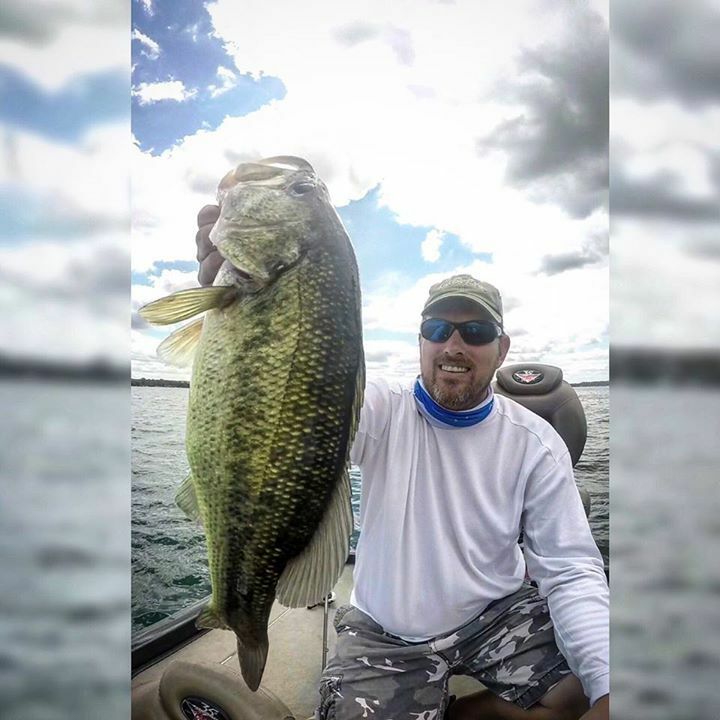 Typically Cayuga is a known destination for trout anglers, but in the past two years this massive body of water has produced some giant largemouth bass. If you don’t know what to look for, unlocking it can be a daunting task for sure. I’m going to show you what you need, where to go, how to present your baits, and even where to stay while you’re there, so that you’ll have an absolutely magical experience catching giant Cayuga Lake Largemouth Bass! I lived on the east shore for two years chasing Cayuga Lake largemouth bass during the summers in Aurora, NY, so I know first hand just how tough this lake can be to figure out. I’ve taken years of tips from others and experiences of my own to come to find a pattern that works for me in the hot summer months, and it can easily work for you too. The begin with you need to have a good graph with updated cards in it. This lake has really specific ledges, humps, and depressions that are easily missed but paramount to locating big fish. Having my Humminbird 1199s and Navionics Hotmaps Platinum East cards really do give me a huge advantage from the very beginning. Unlike Ontario or Erie, you’re not looking for specific rock piles or shoals; you want to find areas that have both hydrilla and milfoil, and then you either want to be on the outside of that grass bed, or the inside of it. Depending on the size and location, you might be in 40 feet, and you might be in 7. Recently, I was in areas that were 15 feet deep, and that’s not 14, or 16, it’s 15 feet, which was the deeper (outer) edge of that particular set of weeds I was fishing (people who like my Facebook Page can send me private messages and I’ll send you exact coordinates from my Navionics App). The second key is having the right bait. On my last trip I wasn’t the only boat on the lake. I had unknowingly arrived to find the NJ Bass Federation having the second day of their two-day tournament that Friday (I prefer fishing during the week when I’m not fishing tournaments so that I’m not fishing when guys are competing and I didn’t know it was a tournament until the end of the day when I saw the weigh in), so it’s not a huge surprise that my favorite areas were shared with others. Sometimes there were as many as 20 other boats in the areas I was fishing. But what I was doing different allowed me to catch almost 80 fish that day, while most of the other guys struggled to catch limits. 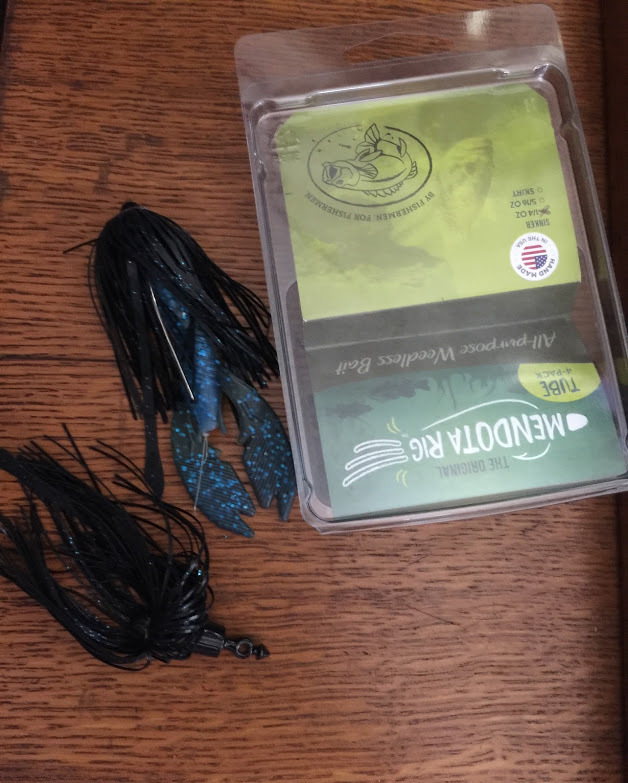 For several months I’ve been fishing a Mendota Rig by Slop Frog Baits. 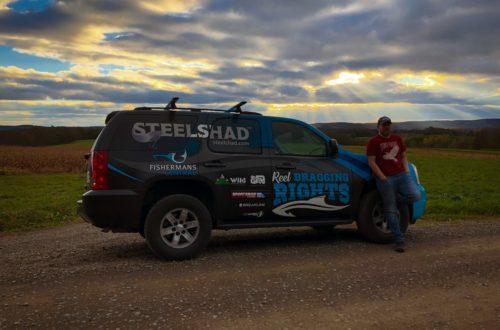 Simply put, it’s a reverse weight system where the weight is at the bottom, rather than above the hook that requires a weight that’s been specially designed to have the hook pass through it. In the last couple of weeks I’ve been trying to find different combinations of weights/baits/hooks to see just how versatile this can be. In this particular trip I was using a 1/4 oz and a 1/2 oz Mendota Rig weight, both of them skirted, and I was using a soft plastic like the craw pictured below from Whip Em Baits, with a Trokar Magworm hook (TK 120-4/0). I replaced the skirt that came on the weight with a blue and black skirt, and rigged it on a 13 Fishing Omen Black 7’11 Heavy Action with 20 pound Seaguar InvizX spooled on my Inception high speed reel, and usually I was making really long casts. I know what you’re thinking, you can do the same thing with a jig, or with a Texas Rig craw. While that’s true, you won’t have the same success as I did because you’ll need a much heavier weight (minimum of an ounce) which will make the fall very different, the bite different, and the presentation different. When you hook the plastic with a Mendota Rig you want to do it the opposite that you’re used to, so that it falls perfectly through the weeds with the appendages facing up. We had probably a third of our fish hit it on the fall, and the majority of the fish (including all 3 that were over 5 that day) came on the 1/4 oz weight. 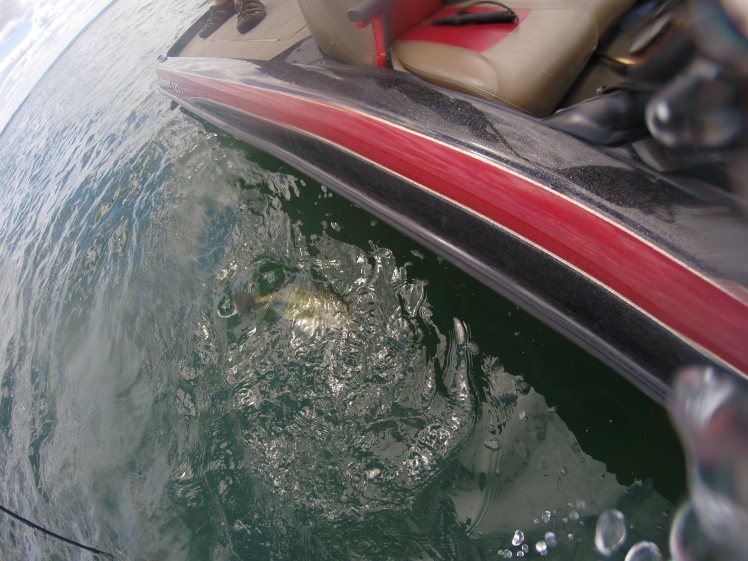 Cayuga Lake largemouth bass are deep in the summer months, and traditional methods and areas won’t deliver the bigger fish as routinely as this deeper pattern will. The next important part of this trip was my eyewear. Because believe it or not, Cayuga is so clear that you can see right to the bottom in 20 feet as if you were staring at your bathtub. 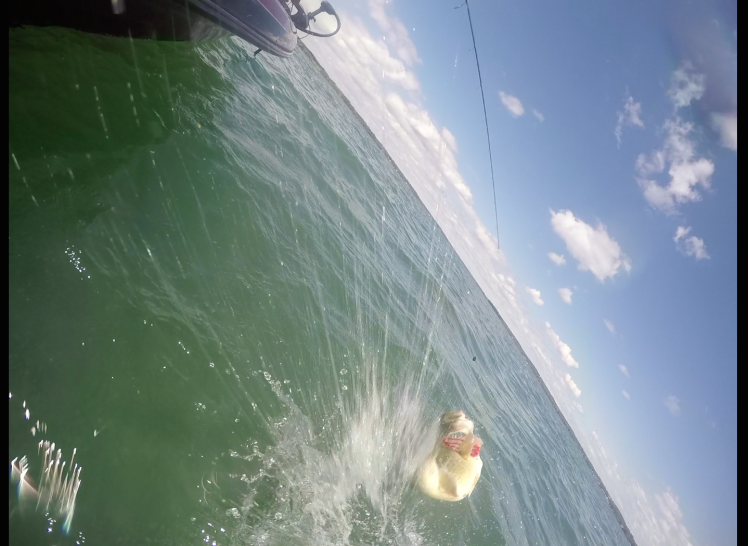 This was my second trip out on the water since I got a pair of sunglasses from Breakline. I’ve worn every pair of glasses from Kaenon to Smith and Typhoon, and I was skeptical about the difference in the Zeiss lenses being as big as I had heard in the past. But these felt different the minute I put them on so I gave them a shot. Believe it or not, I actually saw this big fish below as it was cruising through an opening in the grass. I flipped in there, felt a tick, and the rest is history. That huge smile on my face is because I just sight fished and boat flipped a largemouth over 5 pounds in over 15 feet of water, in August! How often can you say you did that?! But what I like best about these glasses is how clear the lenses are, and how much sharper it feels like my eyesight is. They fit perfect on my face, and there’s total coverage of my field of view, so there’s no cut off between. Everywhere I look, in every direction, is covered by these babies. 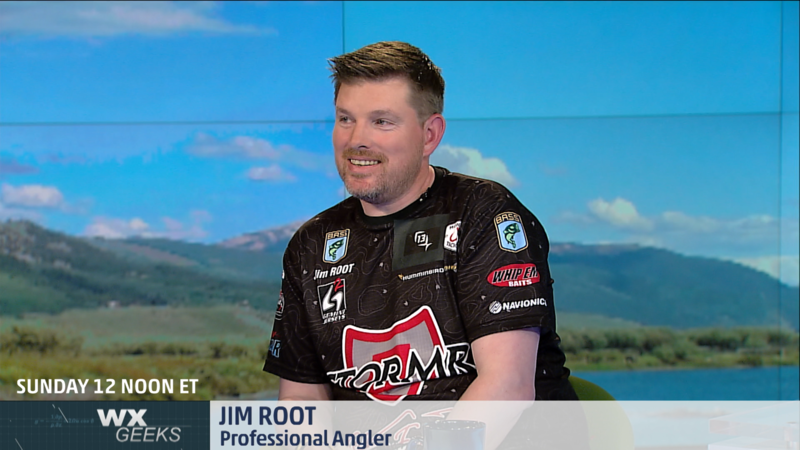 So I’ve told you what depth to look for, what bait to throw, how to rig it, and given you some advice on glasses to wear to help you find, target, and catch Cayuga Lake Largemouth Bass. The only thing left is perhaps the most comforting, and that’s where to stay. For me, I like to travel with my friends and my family as much as I can. So we typically look for places that accommodate us all. Recently, while at Cayuga to film a pilot for a new TV Show we had the pleasure to stay at Osprey Manor (click here to see it on HomeAway.com), an incredible house owned by Paul and Laura Bentz in Cayuga, NY. 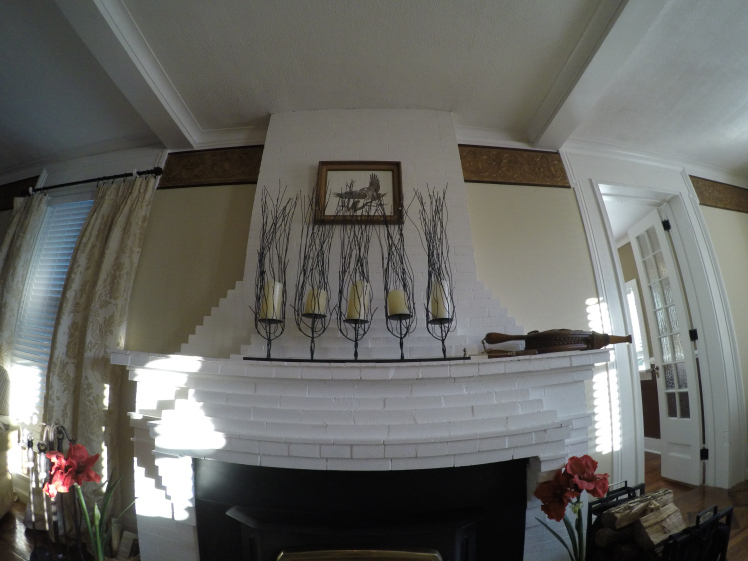 The house sleeps 21, has a working fireplace, a beautiful kitchen, 3.5 bathrooms, satellite tv and wifi, water fountain, game room, outdoor fireplace. All you need to bring is your food and a desire to relax. The bathrooms even have racks to heat your towels for you while you bathe in a deep garden tub, or rinse off in a rain shower. There’s more than enough parking outside for multiple rigs and plugging in is easy. Paul and Laura are also the proud owners of the Finger Lakes Pretzel Factory, and their daughter Lauren makes the best soft pretzel you ever had! This is a great place to stay for the whole family, or for just a bunch of guys who want to stay together and have easy access on and off the lake at the north end, where to bass fishing really is the best. Good luck and enjoy some more pics from my recent trips there! 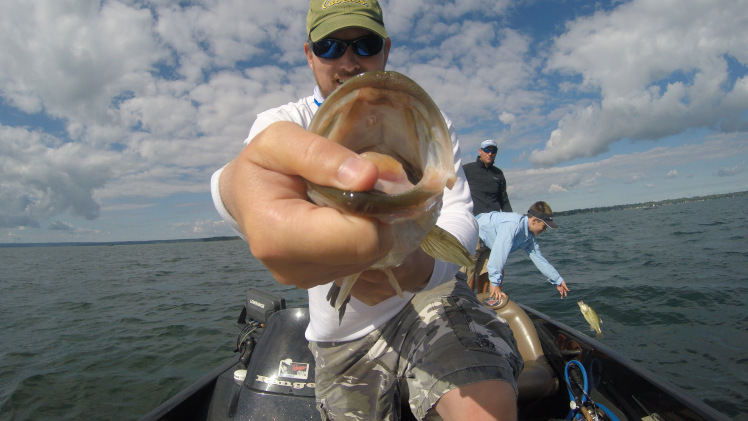 Love smallmouth bass fishing? 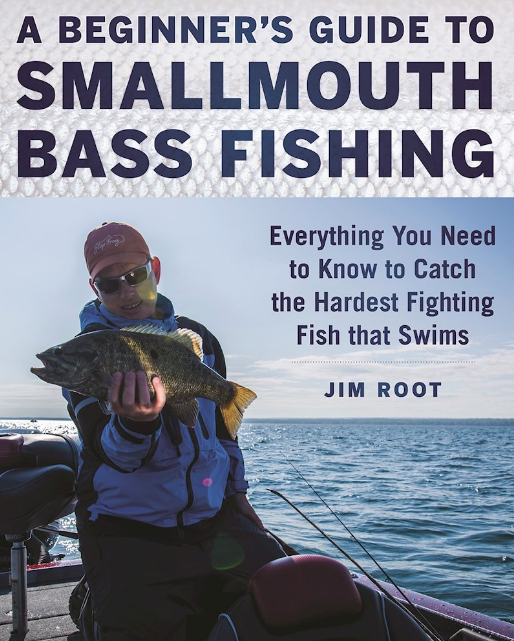 Pick up a copy of my book at Amazon and learn every secret I have, guaranteed to help you catch the biggest smallmouth bass of your life!